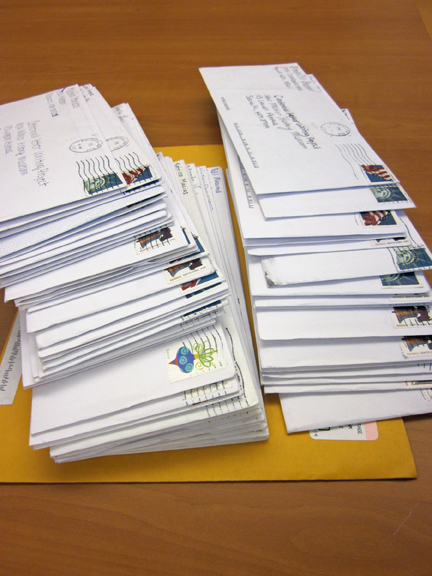 We recently received a lovely stack of hand-written letters from fifth-grade students at Piñon Elementary School in Santa Fe. 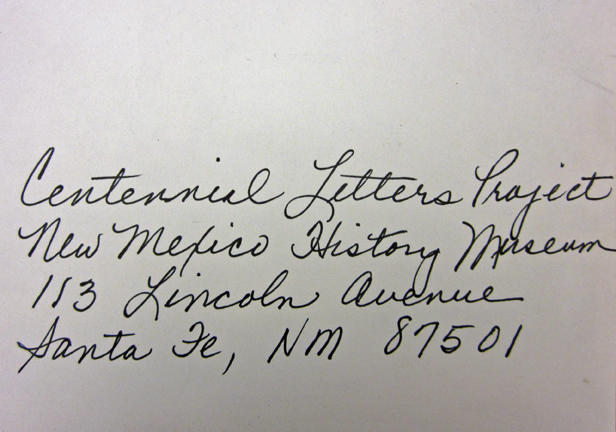 Their teacher had read about our Centennial Letters Project and the effort to collect the thoughts of New Mexicans on this 100th anniversary of statehood — our gift to the historians who will one day document our bicentennial. We couldn’t resist sharing some of those 10 and 11 year olds’ thoughts with you. As you’ll see, their young lives are not always easy, but their optimistic outlooks are heartening. On the upside, one girl described life as a fifth-grader in such enthusiastic terms that she kind of makes us want to go back to elementary school: I go to PINON school. I like it there because you learn a lot like Math, Reading, and Spelling. I like homework because you never stop learning, even when you are out of school. I have loved all of my teachers since kindergarten to fifth grade. … I think fifth grade is a great experience. I have to say fifth grade is like being in a place made out of rainbows, and every color in the rainbow means peace. You learn and never stop learning. You can be a smart person thanks to fifth grade. 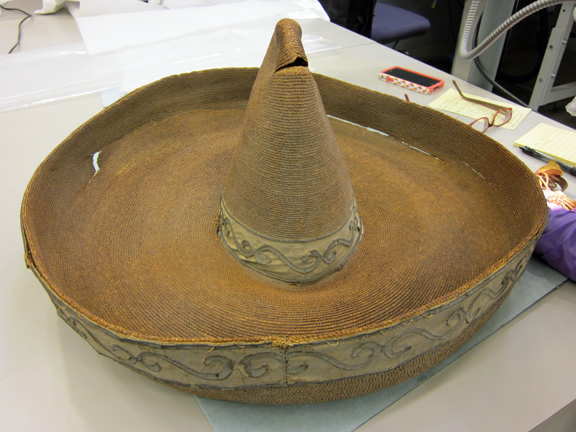 One of the latest artifacts to make its way into the History Museum’s conservation lab: a very well-worn sombrero plucked off the battlefield in Columbus, NM, after Pancho Villa’s raid. Conservation intern Cindy Lee Scott began working on the piece this week, and her efforts show just how different conservation work is from restoration work. Proof No. 1: If the hat really was part of an infamous battle, then Scott will only clean off the last few years’ worth of dirt. The sombrero was donated to the museum in 2008 by the grandson of a Columbus woman who found it after the raid on her town. It’s relatively simple, with decorations on only the brim and the hatband, and it’s definitely seen better days, with a few holes showing on its brim and near the top. Through her investigation, Scott has already determined that some of what we believed about it isn’t true. For one, it isn’t made of woven straw, but of many tiny braids of straw sewn together. And it might not even be straw, but we’ll have to see whether our equipment can detect a difference between hay, yucca fibers, or some other material. In addition, what appeared to be a leather brim and hatband is in fact a painted woven fabric with leather curlicues stitched onto it. According to a history of Columbus posted on New Mexico State University’s website, Villa’s raid came suddenly the night of March 9, 1916, as the Mexican Revolution raged to the south. Columbus was “a sleepy little border town,” and about 350 U.S. Army soldiers from the 13th Cavalry were stationed on its outskirts. Despite that seeming defense, Gen. Francisco “Pancho” Villa and up to 600 Mexican revolutionaries stormed into town. The fighting lasted from about 4:20 am to dawn, just 90 minutes. In that time, up to 75 Villistas and 18 Americans, most of them civilians, were killed. 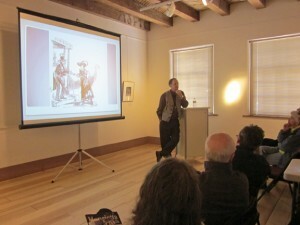 The History Museum has a section about the raid in our main exhibit, Telling New Mexico: Stories from Then and Now. Included in it is the clock that was stopped by a bullet and a death mask of Villa, who was stopped by a hail of bullets fired by a band of assassins in 1923. While it would be nice to say that Villa once wore the sombrero, we won’t. We can’t prove it. Besides that, it doesn’t say “Hecho in Mexico” or bear any other label that might lead us to a hatmaker or a town of origin. But it could date back as far as 1900, and Scott’s work might put a more definitive date on it. 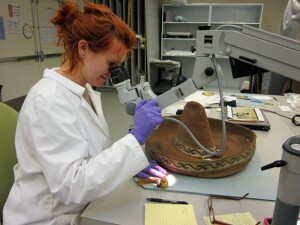 Another proof that this is conservation not restoration work is that the hat’s damaged parts likely won’t be repaired. Instead, as any wise conservator will do, the damage will merely be stabilized so it doesn’t get any worse. And as for this writer’s wise-guy suggestion that the conservators pull some DNA from the sweat that likely once soaked the hatband and throw it into some kind of microfabricated polymeric nanochannel RTPCR mumbo-jumbo device in order to identify its owner, Scott was firm and clear. As New Mexico was hoping, wishing and praying for statehood, 60 years’ worth of forces aligned against it. The New York Times took the position that the outlaw frontier of New Mexico represented “the heart of our worst civilization.” Former Vice President and pro-slavery Sen. John C. Calhoun said in 1848 that “to incorporate Mexico would be the very first instance of incorporating an Indian race. … Ours, sir, is the government of a white race. The greatest misfortunes of Spanish America are … of placing these colored races on an equality with the white race.” Others considered the state too poor. Or too Catholic. Or too likely to side with northeastern senators than southern senators. There was also the tale of New Mexico Sen. Stephen B. Elkins ill-timed handshake of a colleague who had just, unbeknownst to Elkins, given a fiery anti-slavery speech, thereby costing the New Mexico statehood bill every Southern senator’s vote. He also brought up an old wound: the surveyor mistake that gave a good (and oily) chunk of rightful and proper New Mexico land to the state of Texas–a still simmering matter that we wrote about in this blog post in 2009. One of his best points is one well worth remembering in this Centennial year: “What New Mexico was in 1912, the United States has become over the past 100 years. We sent the first Hispanic senators to Congress, the first Hispanic representatives. We elected the nation’s first Hispanic governor.” The territory’s melting pot today mirrors a nation that once was ruled by Anglo men of means. These monthly lectures, organized by Tomas Jaehn of the museum’s Fray Angelico Chavez History Library, are well worth putting on your calendar. (Next up: “Understanding William Howard Taft,” by Noel Pugach, professor emeritus of history at the University of New Mexico, April 18 at noon.) They’re free. The speakers are smart and interesting. And you walk away from a mere hour with enough knowledge to impress your friends, family and coworkers. Who knows, you might even get to sing. At the end of today’s lecture, Hunner cajoled the crowd into joining him in a decidedly monotonic version of the official state song, “O, Fair New Mexico.” Next time, we’ll do a little warm-up first. 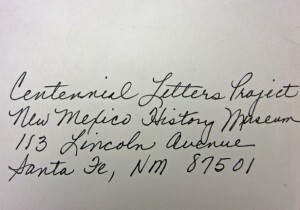 When we launched the Centennial Letter Writing Project on Jan. 6, 2012 (the 100th anniversary of New Mexico statehood), some of us at the New Mexico History Museum wondered aloud whether we’d eke out even 200 letters over the next 12 months. Well, it’s early March, and we’re about to zoom past that total. The stack at left? That’s just today’s haul. 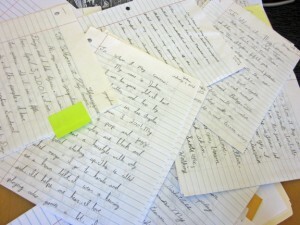 Students in the Upward Bound college-prep program in Roswell have written by the dozens. So did a class at St. Michael’s High School, members of a creative-writing group in Taos, and individuals of all ages in Albuquerque, Santa Fe and elsewhere. Our request was simple enough (though it seemed a bit of a burden to the Twitter generation): Tell us about your life in the year 2012 so that historians in the year 2112 might have some first-person accounts told by rank-and-file residents. We want to hear what your neighborhoods are like, your houses, your career, what you worry about and what gives you hope. Think about what someone 100 years from now might want to know about you. The type of car you drive, its color, what it can and can’t do. The stores you shop at and what you buy there. Do you visit a farmer’s market? Describe the vendors and their produce. Tell us how you make your family’s favorite holiday food and where you get the ingredients. Do you work out? Where? Do you ride bikes or go hiking? Describe the route. Over the next few months, we’ll post excerpts from some of those letters here on the blog. We hope you enjoy reading them as much as we have. And we hope that you, too, will put pen to paper (or fingers to keyboard; computer printouts are A-OK) and tell us about your life.